Things tend to find different rhythms on their own out here in the Atlantic Ocean. The sober and quiet, sometimes seemingly phlegmatic pace characterizing the islanders and their environment, can without further ado turn into frantic action-packed activity. A phenomenon conditioned by the islands' location on the ocean currents and the crossroads of high and low pressures. For the native Faroese this is a part of life. In the morning lazy waves roll quietly and rhythmically against the coast - in the afternoon violent surf breaks on the same shore, leaving white foam and turquoise whirlpools in its wake. On the way to the grocery store white cumulus clouds drift lazily across the blue-grey sky - on the way home torrential rain falls from a thick dark carpet of clouds - and, believe me, in the Faroes it always rains sideways. These contradictions, or rather dualism, become quite clear in Saviour Mifsuds’ photograph on which this postage stamp is based. The lovely little cottage, built for relaxation and days of "easy living", stands close to the foaming waterfall in Skorá River by Mjávøtn in the centre of Streymoy. Here it seems as if the frail and the delicate are shown in contradistinction to the tremendous and the violent - a house of dolls against the awful forces of Nature. On a daily basis Skorá is not quite as impressive - a rather prosaic river on a mountainside, no different from most other rivers found in the islands. It's easy to be fooled by the running stream, its murmur and whispers in the silence of the summer night, bringing sweet dreams to guests sleeping the summer house. 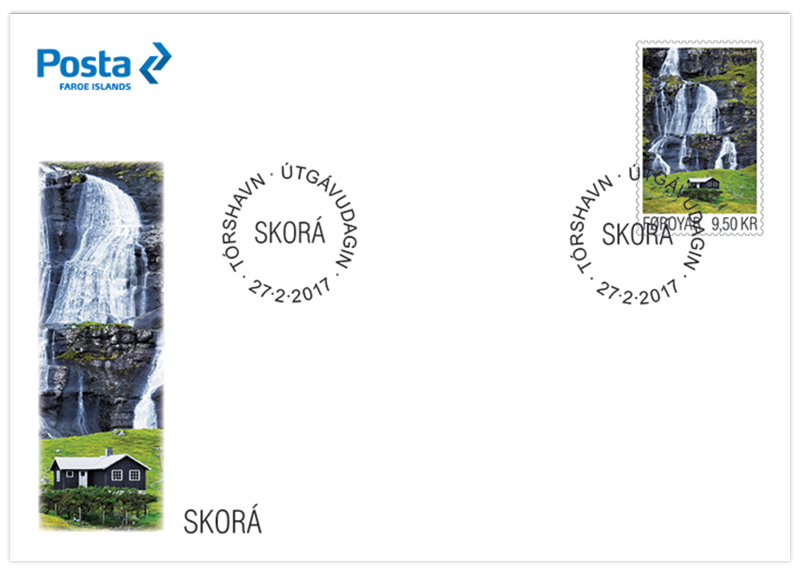 But even in its mild mood, Skorá reveals it’s potential. The alert viewer observes immediately the traces it has left in the landscape. The black rocks in the green mountain side serve as a traffic sign warning of temporary violent activity. There is practically no groundwater in the Faroe Islands. Naturally enough, since the islands' foundation consists of solid rock - the result of millions of years of volcanic activities, which with steady outbreaks stacked layer upon layer forming the Faroes’ basalt plateau. The ravages of time, the mighty and constant glacial digging, water erosion and millennia of wind and weather, left the rocky islands of the Faroes as we know them today. On the solid rocky ground there is a thin layer of soil - and since it only can absorb a fraction of the rain that annually falls in the Faroes, only the law of gravity determines the fate awaiting the water. It can only run down the mountain slopes - and it only takes a few hours of rainfall for the mountains and higher-lying valleys to collect the water and transfer it down in Kollfjarðardalur via Skorá and her frothing sisters. In the valley we find Mjávøtn, two small and not very deep lakes acting as inlet reservoir for the big lake, Leynavatn, further down the valley. On its good days, after drinking its fill up in the mountains, Skorá tumbles down the hill side, wild and beautiful, with white fluttering skirts woven by impish witches. Down it goes in the valley, down in Mjávøtns’ centre lake, on to Leynavatn and from there down towards the sea at Leynars’ beautiful sandy beach. And the small fragile house? Well, it's really just an illusion. 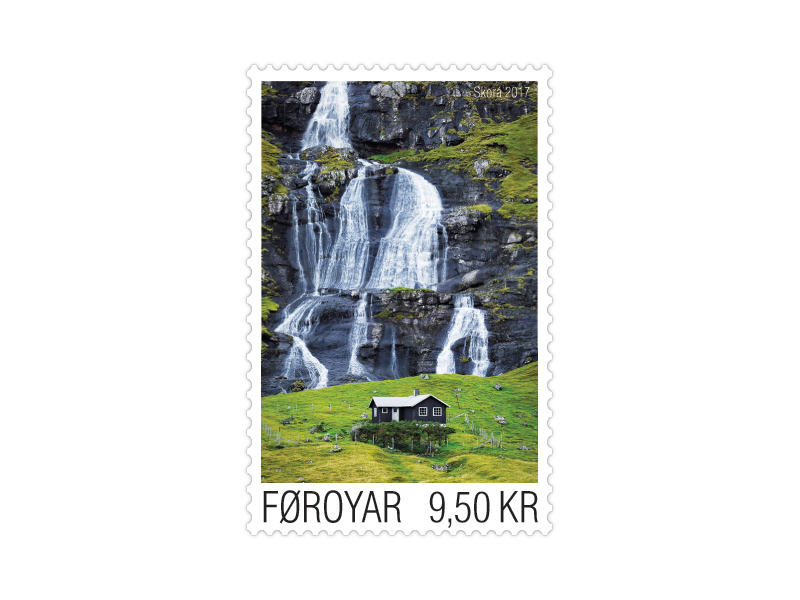 It has been there as long as I can remember, and is just as robustly built as all other houses in the Faroe Islands. After centuries of experience it was built on a small mound in the landscape, so neither Skorá, her sisters nor the swirling winds in the valley can budge it. Indeed, it would not surprise me if in Skorá's wild cascades you also could hear the voices of children at play. After all these are the Faroe Islands – the land of wild contrasts.